An Indoor facility to protect your car from the elements and provide high security whilst you are away. 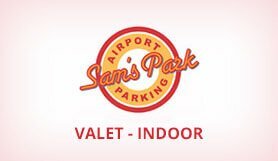 With low prices and an unbeatable personalised service, Sams Airport Parking LAX is a convenient valet parking service very close to LAX airport. This ideal location is here to bring you top class indoor parking. Its located just 1 mile from the entrance to the terminals and the free shuttle operates 24 hours a day. Amongst the largest off-airport valet services at LAX, Sams has over 35 years of experience and prides itself on quality and its outstanding relationships with clients. The facility is safe & secure, well-lit, modern, licensed, bonded and insured with 24hr cameras. Each valet has a minimum of 5 years experience. The rates are amongst the cheapest at LAX and thrown in with the convenient location and great service we truly believe you won’t find better value. Reserve your spot online for the best rates, and to avoid disappointment, ensuring a stress-free LAX airport parking experience prior to your journey. Undercover LAX parking for an Unbeatable Rate. Awesome Value. Shuttles run every 5-15 minutes 24 hours a day on demand. 1 mile away from LAX. Brand New Mercedes Sprinter Shuttles Clearly Labeled Sam's Park. Pick Up is at the red sign that reads "Hotels & Courtesy Shuttles." Please print and bring along your booking confirmation. Please note that you may be charged extra if your bring a vehicle larger than a standard size family car. Park up in one of the marked bays and bring your keys into the office. You'll be transported to LAX airport in one of our Brand New Mercedes Sprinter Vans in minutes. Go to the courtesy bus area outside arrivals and one of our shuttles will be with you in a matter of minutes.